The Joint Committee, composed of a delegation from the Anglican Communion and the Permanent Committee of Al-Azhar al-Sharif for Dialogue with the Monotheistic Religions, held its third annual meeting in Al-Azhar in Cairo on 23 and 24 Rajab 1425, which corresponds to 8 and 9 September 2004. 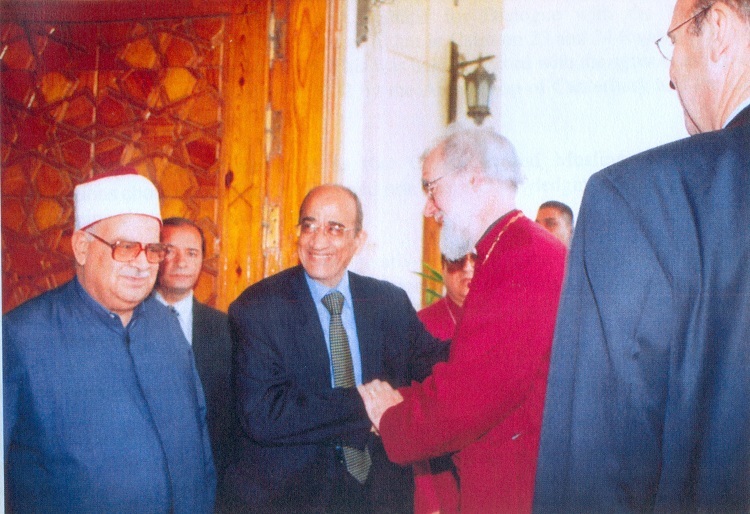 This was held in accord with the agreement signed at Lambeth Palace on 30 January 2002 by the Archbishop of Canterbury and the Grand Imam of Al-Azhar. We were encouraged to hear reports of cooperative ventures between Christians and Muslims in both England and Egypt. We noted the decision by the Archbishop of Canterbury to help establish a national Forum in England to enable Christians and Muslims to discuss matters of common concern. Additionally, we appreciated the efforts by Al-Azhar and the Episcopal Diocese of Egypt to give practical expression to our dialogue at the grass roots level, in a variety of ways. As regards the Holy Land, a place of particular significance to both Muslims and Christians, we expressed our regret that since we last met in September 2002 the deterioration in the situation there has increased the injustice, violence and hardship experienced by many. We look forward to deepening our dialogue at a further meeting in autumn 2005. Commit ourselves to use our influence in our respective religious communities to counteract misconceptions about Christianity or Islam, being aware particularly of the danger of generalization about either faith based on the actions or views of a minority. Commit ourselves to developing our joint study-exchange programme for students and religious leaders in training. Commend the initiatives undertaken by the Archbishop of Canterbury in the area of Christian-Muslim relations, especially plans for the establishment of a national Christian-Muslim Forum in England. Commend the cooperation of Al-Azhar al-Sharif under the leadership of the Grand Imam and the Episcopal Diocese of Egypt. Welcome the setting up of the National Council for Human Rights in Egypt. Commend all international efforts to bring about security and a just peace for all in the Holy Land, particularly appreciating the role of the Egyptian government in this respect. Agree that the Joint Committee of Dialogue should meet again for a further dialogue in autumn 2005.